In Lightning Platform, Salesforce provides multiple options to administrators so that they can grant data access to different users, groups, teams. But there is something which is implemented and maintained by Salesforce which will also give relational data access to users based on their's access to other records. In Lightning Platform, it is known as Implicit Sharing. Administrator cannot change the way implicit sharing works. So it is very important to understand the different types of implicit sharing we have in the platform. 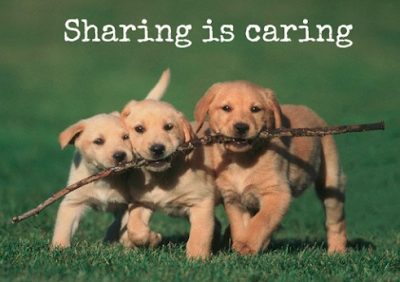 In this blog post, I am going to explain different types of Implicit Sharing and how it works. To understand, let's first consider the Account and Contact object. These two objects are linked with each other. So let's say the Organization Wide Default for both Account and Contact are mentioned as Private, i.e. the record owner can see the records they created or owned. Parent Implicit Sharing: This sharing provides read only access to parent record if the user is having access to the child record. Example - Refer the picture below. Here Bob is getting read-only access to Account because he is having access to the Contact (bcoz: Jimmy manually shared the contact with Bob). The level of Account access Bob will get is Read-Only and it is because of Parent Implicit Sharing. 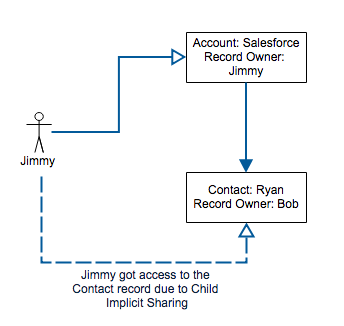 Child Implicit Sharing: This sharing provides Read/Write access to child record if the user is the owner of the parent record. Example - Refer the picture below. 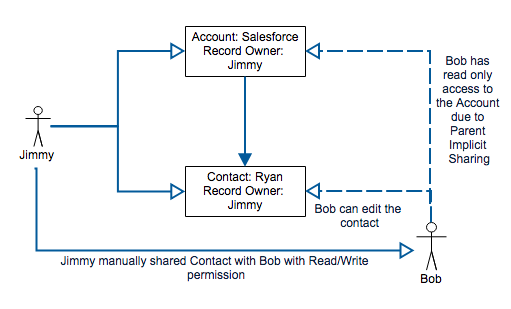 Here Jimmy is getting read-write access to Contact because he is the owner of the Account record. The level of Contact access Jimmy will get is Read/Write and it is because of Child Implicit Sharing. 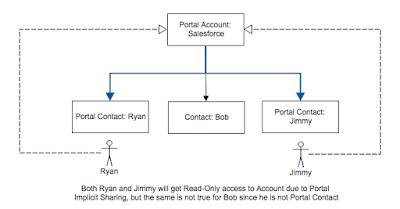 Portal Implicit Sharing: This sharing will provide Read-Only access to portal account and all associated portal user's contact record using portal role sharing. Example - Refer the picture below. 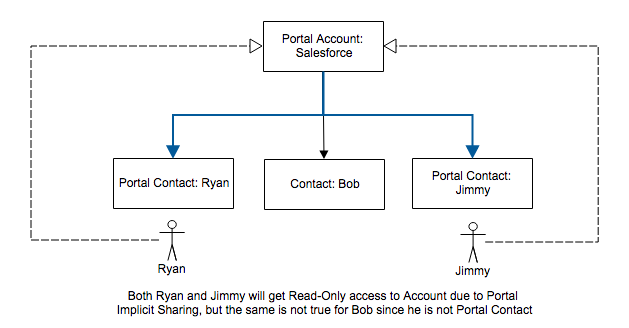 Here both Ryan and Jimmy are getting Read-Only access to Account because they are portal contacts. This is happening because of Portal Implicit Sharing. But contact Bob is not having any access to Account since he is not enabled as Portal user yet. High Volume Portal Implicit Sharing: In this Implicit sharing any record owned by high volume portal users will be shared with other high volume users who are part of Sharing set. High Volume Parent Implicit Sharing: In this implicit sharing, read only access will be given to parent account of records shared through a sharing set to other user members. I would recommend going through the below documents to understand how the sharing and record level access is maintained within Salesforce. While implementing features, we need to write code to call external web services to fetch or update information. But calling external web service doesn't mean we should wait for the response from the web service. That is a bad design. We should always write code in such a way so that we can call external web service and still continue to do other work and when the response is available from the web service, we will update the page with response. This way of calling web service is known as Asynchronous callout. Since in Salesforce, we are living in a multi-tenant architecture, so calling external services synchronously can create issues if the response is taking too much of time to come due to network latency or complex calculation or long running requests. There can be n number of reasons why the response is taking longer time. To make sure System resources are available to all customers, Salesforce introduces limitation on how much synchronous callout you can do from a single organization. Limit is each org can make a maximum of 10 synchronous requests running for more than 5 seconds. When the limit is reached, any subsequent request will fail until and unless an existing request completes successfully. Apex continuation is an architectural design which will allow to call long running external web services in a scalable fashion without blocking any server threads and also avoiding Apex concurrency limit. With Apex continuation, you can make asynchronous external web service callout and then continue working on other activities. When the response is available, callback method will take care of that and take actions like - updating some values in object, rendering a section of the visual force page to display the result. Below code snippet will demonstrate how you can use Continuation object for making Asynchronous callout. I will be using two external web services for this demo. So you need to add them in your developer org's Remote Site settings.